List building or leads capturing is the foundation of all businesses online. Business owners who are profitable online have a huge list of targeted and responsive subscribers. However, most of the business owners are not optimizing the Opt-in potential to capture more leads on their websites. Are you one of them? Once the visitors leave your websites, they may be gone forever. There is a need to capture the contact information of these visitors, so that you can follow-up with them in future. If you have trouble or problem setting up and inserting nice Opt-in forms on your website, I suggest you take a look at Premium List Magnet. Create unblockable, beautiful OPT-IN left/right/top/bottom sliders, as well as lightbox popups. 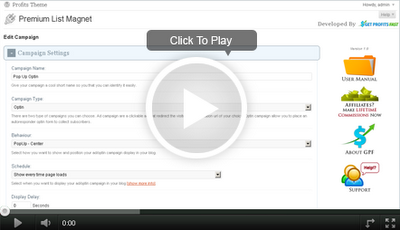 Easily and instantly create UNLIMITED optins and ads without any design or programming skills. Add an opt-in form to your blog sidebar easily. Click here to find out more about Premium List Magnet.